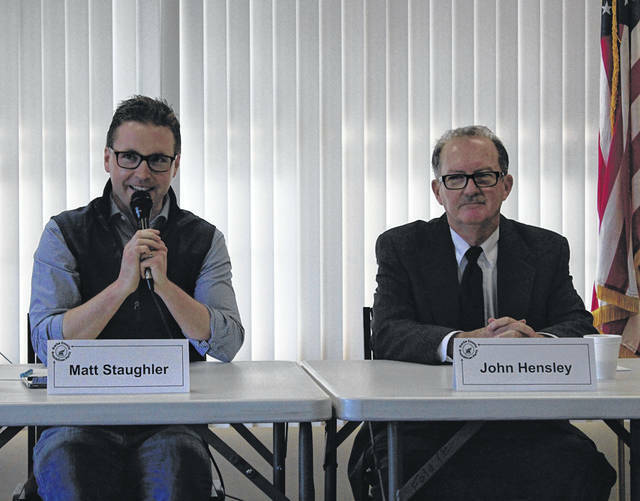 Greenville City Council candidates Matt Staugler (left) and John Hensley (right) answered questions during a GOP candidate’s forum held Saturday at Brethren Retirement Community. Attorney Mike Rieman (left) and Darke County Prosecutor Jesse Green (right) hope to be nominated for the position of Greenville city law director. 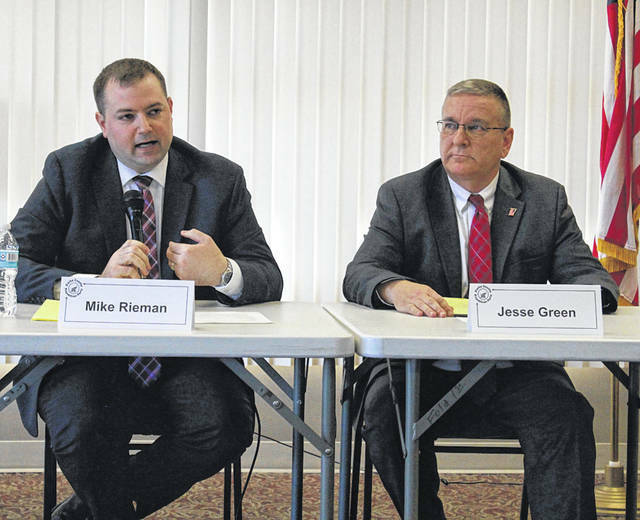 GREENVILLE — Republican primary candidates for City of Greenville offices participated in a forum Saturday at Brethren Retirement Community’s Chestnut Center, hosted by the Darke County Republican Women’s Club. 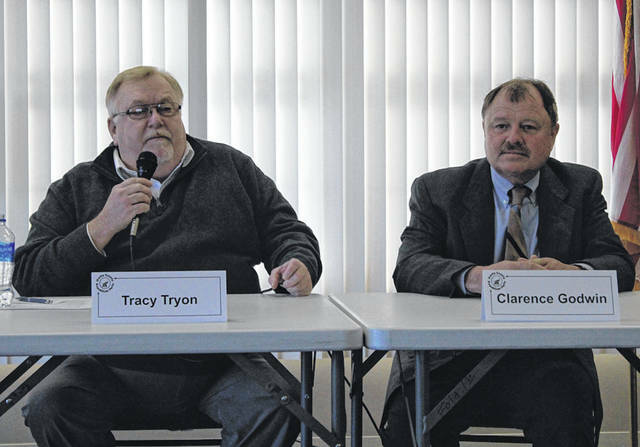 City Council candidates Clarence Godwin, John Hensley, Matt Staugler and Tracy Tryon, as well as city law director hopefuls Jesse Green and Mike Rieman, all answered questions in anticipation of the May 7 primary election. Godwin, the incumbent, and Tryon, the challenger, are vying to win the GOP nomination for the city’s 1st Ward council seat. Godwin has served on council for eight years. Tryon is seeking a return to council after losing a GOP primary race for an at-large seat in 2017. “The difference I think that I bring is my understanding of the finances of the City of Greenville,” Tryon said. “One of the things I’m proud of is, I’ve never missed a council meeting,” said Godwin, adding he worked hard to make it to council’s committee meetings. Both candidates agreed on most issues raised during the forum, including the drug problem, which both called the biggest issue facing the city. “We need to educate our youths, adults and make sure we have the resources to assist the people who are trying to clean themselves up and also have the law enforcement personnel trained to identify those people and get them the help that they need,” Tryon said. Hensley and Staugler are seeking the GOP nomination for the city’s 4th Ward seat. An incumbent, Hensley was first appointed to council in 2016, taking the seat formerly occupied by Steve Willman, who left to become mayor. Newcomer Staugler currently serves as director of the Darke County Visitors Bureau. Staugler said he wants to be on council because of various problems in the city he sees not being addressed, including crumbling streets, bad sidewalks, bad rentals, slumlords and dead trees in the park. “We thought ‘someone’s working on that.’ A year went by nothing changed, another year went by, nothing changed, another year went by and they still haven’t changed. I think this city’s ready for change; I think they’re ready for a new generation of leadership,” he said. Hensley cited his years of experience in law enforcement and on the civil service commission, among his involvement in other civic groups. Asked the biggest challenge facing the city, Hensley said the nationwide drug epidemic. “The main problem is, you can’t force people into recovery,” he said. Staugler called “population loss” the biggest problem facing the city. “I thing I’d like to do if elected to council is look at other communities who are growing and adopt those growth strategies and bring those to Greenville to implement those to get our population back up,” he said. In the race for city law director, Jesse Green, a Darke County prosecuting attorney, vowed to work full-time in the position. “I will be there 40-hours-plus per week to fulfill that role,” he said, adding he planned to have an office in the city building. Rieman, a private practice lawyer, also touted his availability. Asked the biggest challenge facing them as law director, Green replied, “There are a lot of people who leave Greenville, who would like to stay here, but there’s no jobs to be had. So economic development I think is No. 1.” He also pointed out the opioid epidemic in the community as an issue. “The biggest challenge I’m going to face, to be frank, is change. I’m coming in and I’m going to enforce the ordinances that we have,” Rieman said, adding that he would not accept “We’ve always done it that way” as an excuse. The event was hosted by the Darke County Republican Women’s Club with the support of the Darke County Republican Men’s Club and the Darke County Republican Party. This entry was tagged Brethren Retirement Community, Clarence Godwin, Darke County Republican Women’s Group, election, Elections, Forum, GOP, Jesse Green, John Hensley, Matt Staughler, Mike Rieman, primary, Republicans, Tracy Tryon. Bookmark the permalink.